Home » Uncategorized » Shall I fail in order to become successful in EU or European Funding? The famous painter Pablo Picasso has once said that “I begin with an idea, and then it becomes something else”. His point was that the foundation on anything significant in life is based on ideas. However, how many times an idea that you had, stayed an idea in your mind and you didn’t take any actions to implement it with the fear of failure, or even if you did go ahead with your idea, how many times it lead you to lose money, time, resources, friends? An idea can make us rich or make us poor. An idea can make us feel happy or sad, give us energy or exhaust us, make us successful or failed as entrepreneurs as teachers as innovators as professionals as parents as friends. We need to understand that we live in the idea age where companies and individuals succeed or go bankrupt and reach bottom because of their ideas. So, Are there ways for us not only to create but also develop ideas that could change the world and at the end make our life meaningful and ourselves matter for others? Personally, during my whole life I remember myself coming up with new ideas, feeling the energy and this nice feeling of hope that an idea can lead you. But I can say that some of my ideas at some stages in my life lead me to lose money, resources, energy, connection with my family and friends, health and even lose happiness. These were really difficult times for me and could possibly still be if I hadn’t realized that some of our ideas may lead us to mistakes and failures but we need to see those as learning opportunities. We have to realize that as I read somewhere “We are products of our past, but we don’t have to be prisoners of it”. This insight made me believe strongly (so strongly that I have it in my background in all my social media channels) and I say it to my students and people I coach “Feel happier and get wiser by looking in the end of the day at your mistakes as learning opportunities!”. This enlightenment didn’t only make me more successful in life but also motivated me to study mistakes and faulty actions made by others and how they addressed them and manage to achieve great things in order to learn from them. I have realized also something extraordinary that all the great people such as indicatively Tony Robbins, Andy Harrington, Brendon Buchard, Simon Sinek, Stephen Covey, Robert Grene, Robert Kiyosaki, Eric Ries and many many others that made or still make a difference in life of other people had and implemented ideas that failed them miserably. However, they learned from them and they became even more successful that before! Not really since there is another way much much easier and painless. i.e. Learn from the others, learn from those that have failed and have managed to stand up again and build a happy and fulfilling life in their personal and business environment. I give keynote speeches and I run workshops and seminars on how people can exploit successfully funding options (state, public or private) submit proposals to request funding based on great ideas and subsequently deliver valuable projects, services and products in society and make a change. In all those events, I start my speech or training either by asking a relevant question or by congratulating them for coming to my event because they have realized that there is a far better and more effective way of mastering something than learning by doing and sometimes failing and that is learning from the others. Since 1997, I have been working in a business as a manager that my professional success depends a lot on my creativity and systematic approach. Also since 2003, I have been engaged as expert by funding donors (European Commission, Ministries, Associations and Foundations, etc) for evaluating the excellence of ideas and proposals and whether they deserve any further attention or financial support. After all these years, I have realized one thing, that there is a specific pattern as well as systems, formulas, practices and methods (check my Expert Transformation TreeTM) that creative and successful people follow and their ideas, proposals, products and services differ significantly from the failed ones. Be Consistent by applying a set of specific rituals (steps) that will lead to the successful creation of your idea, proposal, project, product or service based on the I. C.R.E.A.T.E.S. System™. Be persuasive by learning how to convince your targets on the excellence, impact and implementation strategy of your idea according to the C.R.I.T.E.R.I.A. Formula™ which allows you to build indisputable arguments. Become fully familiar on how to communicate effectively your skills as expert or the fruits of your implemented idea and increasing significantly your income by applying the Promote & Grow Rich formulaTM. I can personally guarantee to you that by mastering and applying the above four Cs, you will transform yourself, your projects and your businesses. Also, such a knowledge is very valuable for personal and professional life but it will be even more significant if you can be certified as an expert by a world-wide vocational award body. All the seminars that I run can lead to a specialization certificate issued by such an organization that is City and Guilds/Institute of Leadership and Management (www.i-l-m.com). 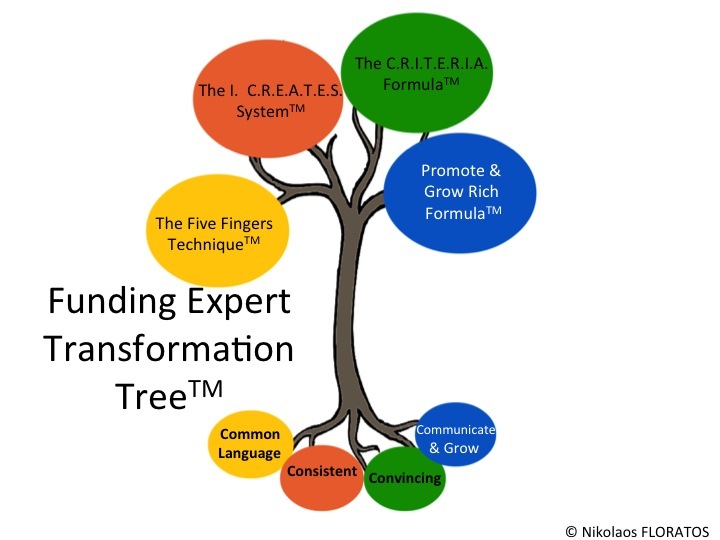 Finally, since our time is rather limited, I am not planning to present the whole Expert Transformation Tree in this article but I will explain briefly the first letter I. from the I.C.R.E.A.T.E.S. System™. Last but most importantly, we need to apply the following trick. We need to ask ourselves the question “If I win today the lottery that allows me to live for some years a comfortable life, will I still go ahead with this idea and invest the winning on implementing it”? If we answer “NO” then we need to drop the idea and focus on something else now that it is still early without wasting any other resources and energy. But if our answer is a big “Yes” then we can go ahead with the rest of the steps in the I.C.R.E.A.T.E.S. System™ and a wonderful trip begins. Those proposals and projects that do not follow the above simple three principles at their very initial stage, they are doomed to fail and waste in vain many resources and energy. On the other hand, winning proposals and successful projects that add real value in society have followed the above three principles even sometimes unconsiously, without realising it. I hope this article serves you well in the area of planning and management of european funded projects. If you would like more training in this area, visit my seminars’ page (check Live Courses and eCourses). So that’s it. I believe you learned something that you will be able to apply it in your particular situation in European Funding, without the need to fail first for becoming successful! Hello Nikolaos! Thank you so much for this informations. I appreciate your work and I hope manage to get Erasmus project. Best regards from me and my students! Bye! Hello Nikolaos! Thank you for your work and keep in touch because i would like if you write something about my italian organization and our job in Europe!! !